We have precipitated solar technology for many years.We designed the upgraded solar string lights which is really better than other's and the old version. All of the above improvements are aim to provide you with a durable,Long working time,brighter and easy-use solar String lights. At Rophie, we believe in our products. That's why we back them all with an 18-month warranty and provide friendly, easy-to-reach support. Waterproof, ideal for indoor and outdoor. Environment-friendly products,up to 17% energy conversion rate. Put on wall, window, door, floor, ceiling, grass, Christmas tree, post or building,adds perfect atmosphere to your place. Switch: Power ON/OFF and MODE. Lighting Mode: Steady On/ Off/ Flashing. Solar panel with ground stake for easy positioning. 1 x Rophie 200 LEDs Warm White Solar String Lights. 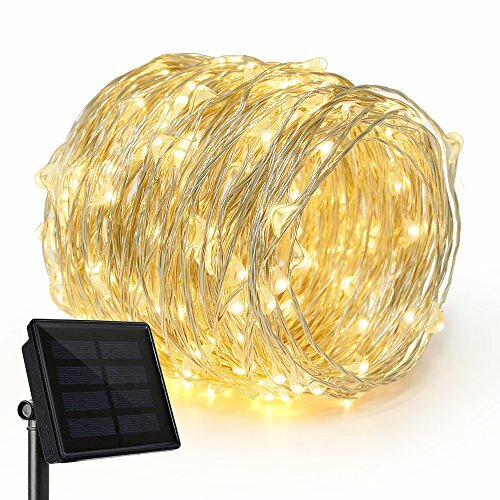 [200 Super Bright LED]-200 Super Bright LED bulbs on 72ft high quality copper wire, with steady 360 degree viewing angle they illuminate in every direction. Ideal for decorating your Christmas tree, gardens, patio, gate, yard, wedding, party etc. Strength brightness can illuminate the entire room; copper wiring is insulated, so will not overheat; remains touch-safe after 15 hours of continuous use; low power consumption. [Rophie Warranty]- Every item you ordered from Rophie comes with 18 Months Warranty & Life time support. If you have any questions about this product by Rophie, contact us by completing and submitting the form below. If you are looking for a specif part number, please include it with your message.